Twelve years after the invasion of Iraq, the US presses onward in a region where it has few clear goals. What could go wrong? In March 2003, when the Bush administration launched its invasion of Iraq, the region, though simmering as ever, looked like this: Libya was stable, ruled by the same strongman for 42 years; in Egypt, Hosni Mubarak had been in power since 1983; Syria had been run by the Assad family since 1971; Saddam Hussein had essentially been in charge of Iraq since 1969, formally becoming president in 1979; the Turks and Kurds had an uneasy but functional ceasefire; and Yemen was quiet enough, other than the terror attack on the USS Cole in 2000. Relations between the US and most of these nations were so warm that Washington was routinely rendering “terrorists” to their dungeons for some outsourced torture. Soon after March 2003, when US troops invaded Iraq, neighboring Iran faced two American armies at the peak of their strength. To the east, the US military had effectively destroyed the Taliban and significantly weakened Al Qaeda, both enemies of Iran, but had replaced them as an occupying force. To the west, Iran’s decades-old enemy, Saddam, was gone, but similarly replaced by another massive occupying force. From this position of weakness, Iran’s leaders, no doubt terrified that the Americans would pour across its borders, sought real diplomatic rapprochement with Washington for the first time since 1979. The Iranian efforts were rebuffed by the Bush administration. Nailing down causation is a tricky thing. But like the June 1914 assassination of Archduke Franz Ferdinand that kicked off the Great War, the one to end all others, America’s 2003 invasion was what novelists refer to as “the precipitating event,” the thing that may not actively cause every plot twist to come, but that certainly sets them in motion. There hadn’t been such an upset in the balance of power in the Middle East since, well, World War I, when Great Britain and France secretly reached the Sykes-Picot Agreement, which, among other things, divided up most of the Arab lands that had been under the rule of the Ottoman Empire. Because the national boundaries created then did not respect on-the-ground tribal, political, ethnic, and religious realities, they could be said to have set the stage for much that was to come. Now, fast forward to 2003, as the Middle East we had come to know began to unravel. Those US troops had rolled into Baghdad only to find themselves standing there, slack-jawed, gazing at the chaos. Now, fast forward one more time to 2015 and let the grand tour of the unraveling begin! It’s easy enough to hustle through three countries in the region in various states of decay before heading into the heart of the chaos: Libya is a failed state, bleeding mayhem into northern Africa; Egypt failed its Arab Spring test and relies on the United States to support its anti-democratic (as well as anti-Islamic fundamentalist) militarized government; and Yemen is a disastrously failed state, now the scene of a proxy war between US-backed Saudi Arabia and Iranian-backed Houthi rebels (with a thriving Al Qaeda outfit and a small but growing arm of the Islamic State [ISIS] thrown into the bargain). Iraq: Obama is now the fourth American president in a row to have ordered the bombing of Iraq, and his successor will almost certainly be the fifth. If ever a post-Vietnam American adventure deserved to inherit the moniker of quagmire, Iraq is it. And here’s the saddest part of the tale: the forces loosed there in 2003 have yet to reach their natural end point. Your money should be on the Shias, but imagining that there is only one Shia horse to bet on means missing just how broad the field really is. What passes for a Shia “government” in Baghdad today is a collection of interest groups, each with its own militia. Having replaced the old strongman prime minister, Nouri al-Maliki, with a weak one, Haider al-Abadi, and with ISIS chased from the gates of Baghdad, each Shia faction is now free to jockey for position. The full impact of the cleaving of Iraq has yet to be felt. At some point expect a civil war inside a civil war. Iran: If there is any unifying authority left in Iraq, it is Iran. After the initial 2003 blitzkrieg, the Bush administration’s version of neocolonial management in Iraq resulted in the rise of Sunni insurgents, Shia militias, and an influx of determined foreign fighters. Tehran rushed into the power vacuum, and, in 2011, in an agreement brokered by the departing Bush administration and carried out by President Obama, the Americans ran for the exits. The Iranians stayed. Now, they have entered an odd-couple marriage with the United States against what Washington pretends is a common foe–ISIS–but which the Iranians and their allies in Baghdad see as a war against the Sunnis in general. At this point, Washington has all but ceded Iraq to the new Persian Empire; everyone is just waiting for the paperwork to clear. The Iranians continue to meddle in Syria as well, supporting Bashar al-Assad. Under Russian air cover, Iran is increasing its troop presence there, too. According to a recent report, Tehran is sending 2,000 troops to Syria, along with 5,000 Iraqi and Afghan Shia fighters. Perhaps they’re already calling it “the Surge” in Farsi. The Kurds: The idea of creating a “Kurdistan” was crossed off the post-World War I “to do” list. The 1920 Treaty of Sèvres at first left an opening for a referendum on whether the Kurds wanted to remain part of what remained of the Ottoman Empire or become independent. Problem one: the referendum did not include plans for the Kurds in what became Syria and Iraq. Problem two: the referendum never happened, a victim of the so-called Turkish War of Independence. The result: some 20 million angry Kurds scattered across parts of modern Iran, Iraq, Turkey, and Syria. In 2014, the Kurds benefited from US power a second time. Desperate for someone to fight ISIS after Iraq’s American-trained army turned tail (and before the Iranians and the Shia militias entered the fight in significant force), the Obama administration once again began sending arms and equipment to the Kurds while flying close air support for their militia, the peshmerga. The Kurds responded by fighting well, at least in what they considered the Kurdish part of Iraq. However, their interest in getting involved in the greater Sunni-Shia civil war was minimal. In a good turn for them, the US military helped Kurdish forces move into northern Syria, right along the Turkish border. While fighting ISIS, the Kurds also began retaking territory they traditionally considered their own. They may yet be the true winners in all this, unless Turkey stands in their way. Inside Turkey, the primary Kurdish group calling for an independent state is the Kurdistan Workers party (also known as the PKK). Its first insurgency ran from 1984 until 1999, when the PKK declared a unilateral cease-fire. The armed conflict broke out again in 2004, ending in a ceasefire in 2013, which was, in turn, broken recently. Over the years, the Turkish military also carried out repeated ground incursions and artillery strikes against the PKK inside Iraq. In light of all that, it’s hardly surprising that early Obama administrationefforts to draw Turkey into the fight against ISIS were unsuccessful. Things changed in August 2015, when a supposedly anti-ISIS cooperation deal was reached with Washington. The Turks agreed to allow the Americans to fly strike missions from two air bases in Turkey against ISIS in Syria. However, there appeared to be an unpublicized quid pro quo: The United States would turn a blind eye to Turkish military action against its allies the Kurds. On the same day that Turkey announced that it would fight the Islamic State in earnest, it also began an air campaign against the PKK. Washington, for its part, claimed that it had been “tricked” by the wily Turks, while adding, “We fully respect our ally Turkey’s right to self-defense.” In the process, the Kurds found themselves supported by the United States in the struggle with ISIS, even as they were being thrown to the (Turkish) wolves. There is a Kurdish expression suggesting that Kurds have “no friends but the mountains.” Should they ever achieve a trans-border Kurdistan, they will certainly have earned it. Syria: Through a series of events almost impossible to sort out, having essentially supported the Arab Spring nowhere else, the Obama administration chose to do so in Syria, attempting to use it to turn President Bashar al-Assad out of office. In the process, the Obama administration found itself ever deeper in a conflict it couldn’t control and eternally in search of that unicorn, the moderate Syrian rebel who could be trained to push Assad out without allowing Islamic fundamentalists in. Meanwhile, Al Qaeda spin-offs, including the Islamic State, found haven in the dissolving borderlands between Iraq and Syria, and in that country’s Sunni heartlands. An indecisive Barack Obama allowed America’s involvement in Syria to ebb and flow. In September 2013, on the verge of a massive strike against the forces of the Assad regime, Obama suddenly punted the decision to Congress, which, of course, proved capable of deciding nothing at all. In November 2013, again on the verge of attacking Syria, the president allowed himself to be talked down after a gaffe by Secretary of State John Kerry opened the door to Russian diplomatic intercession. In September 2014, in a relatively sudden reversal, Obama launched a war against ISIS in Syria, which has proved at best indecisive. The thing that matters most, however, is those Russian planes. They have essentially been given a guarantee of immunity to being shot down by the more powerful US Air Force presence in the region (as Washington has nothing to gain and much to worry about when it comes to entering into open conflict with the Russians). That allows them near-impunity to strike when and where they wish in support of whom they wish. It also negates any chance of the United States setting up a no-fly zone in parts of Syria. The Russians have little incentive to depart, given the free pass handed them by the Obama administration. Meanwhile, the Russian military is growing closer to the Iranians with whom they share common cause in Syria, and also the Shia government in Baghdad, which may soon invite them to join the fight there against ISIS. One can almost hear Putin chortling. He may not, in fact, be the most skilled strategist in the world, but he’s certainly the luckiest. When someone hands you the keys, you take the car. Imagine a scenario that pulls any of those allies deeper into the mess: some Iranian move in Syria, which prompts a response by Israel in the Golan Heights, which prompts a Russian move in relation to Turkey, which prompts a call to NATO for help… you get the picture. Or imagine another scenario: with nearly every candidate running for president in the United States growling about the chance to confront Putin, what would happen if the Russians accidentally shot down an American plane? Could Obama resist calls for retaliation? As before World War I, the risk of setting something in motion that can’t be stopped does exist. What if the United States hadn’t invaded Iraq in 2003? Things would undoubtedly be very different in the Middle East today. America’s war in Afghanistan was unlikely to have been a big enough spark to set off the range of changes Iraq let loose. There were only some 10,000 America soldiers in Afghanistan in 2003 (5,200 in 2002) and there had not been any Abu Ghraib-like indiscriminate torture, no equivalent to the scorched earth policy in the Iraqi city of Fallujah, nothing to spark a trans-border Sunni-Shia-Kurd struggle, no room for Iran to meddle. The Americans were killing Muslims in Afghanistan, but they were not killing Arabs, and they were not occupying Arab lands. The invasion of Iraq, however, did happen. Now, some 12 years later, the most troubling thing about the current war in the Middle East, from an American perspective, is that no one here really knows why the country is still fighting. The commonly stated reason–“defeat ISIS”–is hardly either convincing or self-explanatory. Defeat ISIS why? The best Washington can come up with are the same vague threats of terrorism against the homeland that have fueled its disastrous wars since 9/11. The White House can stipulate that Assad is a bad guy and that the ISIS crew are really, really bad guys, but bad guys are hardly in short supply, including in countries the United States supports. In reality, the United States has few clear goals in the region, but is escalating anyway. Whatever world order the United States may be fighting for in the Middle East, it seems at least an empire or two out of date. Washington refuses to admit to itself that the ideas of Islamic fundamentalism resonate with vast numbers of people. 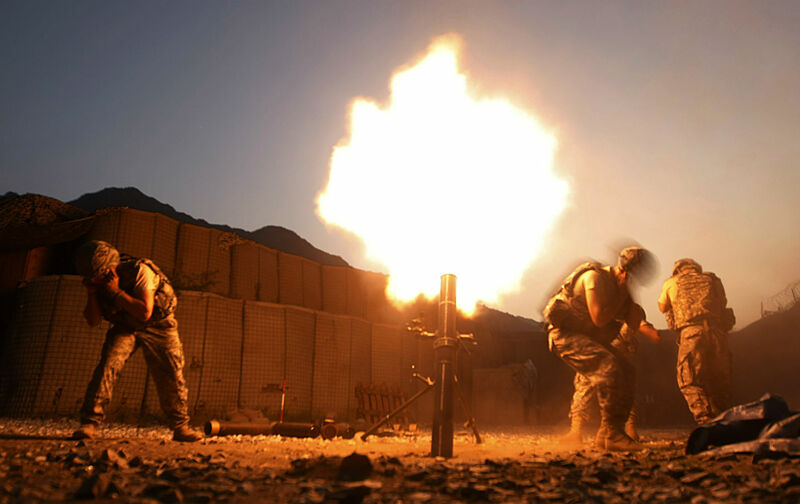 At this point, even as US TOW missiles are becoming as ubiquitous as iPads in the region, American military power can only delay changes, not stop them. Unless a rebalancing of power that would likely favor some version of Islamic fundamentalism takes hold and creates some measure of stability in the Middle East, count on one thing: the United States will be fighting the sons of ISIS years from now. Back to World War I. The last time Russia and the United States both had a powerful presence in the Middle East, the fate of their proxies in the 1973 Yom Kippur War almost brought on a nuclear exchange. No one is predicting a world war or a nuclear war from the mess in Syria. However, like those final days before the Great War, one finds a lot of pieces in play inside a tinderbox. Now, all together: What could possibly go wrong?